The gorilla is the largest primate, weighing as much as 275 kg (600 lb). Gorillas are forest-associated animals. Most gorillas inhabit lowland tropical rainforests and montane rainforests between 1500 - 3500 m (4900 - 11,500 ft). Different populations have exhibited preferences for forest margins, secondary forest, swamp forests, bamboo forests, riverine forests and primary forest. The diets of the eastern and western gorilla populations differ considerably. Eastern animals are predominantly folivorous, but those in the west eat great quantities of fruit. Gorillas spend most of their time foraging on the ground, although young animals and females, particularly lowland gorillas, frequently feed and sleep in trees. Gorillas are diurnal, with nearly all activity occurring between 6:00 in the morning and 6:00 in the evening. Before nightfall, they settle into their nests which are freshly constructed each night. Gorillas live in groups ranging in size from 2 individuals to as many as 38. The western populations have smaller group sizes, averaging 5 members, whereas eastern groups average 9. The gorilla is found in two principal areas: equatorial West Africa and eastern Central Africa. 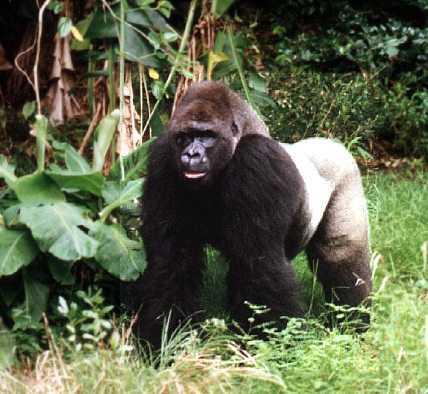 The western lowland gorilla subspecies occurs in West Africa and is the most widespread. The recently identified Cross River gorilla, the rarest of the gorilla subspecies, is found on both sides of the Nigeria-Cameroon border. The eastern lowland gorilla subspecies occurs in the eastern portion of The Democratic Republic of the Congo. The mountain gorilla subspecies occurs in two populations, one on the extinct volcanoes of the Virunga Range along the borders of Rwanda, Uganda and The Democratic Republic of the Congo; and the other in the Bwindi (Impenetrable) Forest in southwest Uganda. Hunting and forest clearance for agriculture and timber are the main threats. African lowland and montane forests are rapidly being destroyed to make way for food production uses such as cropping and livestock grazing. In addition, gorillas are killed in retaliation for crop-raiding. In Central Africa, commercial logging and petroleum exploitation are becoming an increasingly significant threat to the habitat of the gorilla. The internal trade in bushmeat, which occurs over much of the lowland gorillas' ranges, is now a threat. In recent years, human population pressures on the forest habitat of the eastern lowland gorilla have become worse due to the nearly 1 million refugees from nearby Rwanda and Burundi. A recent study of DNA indicated a striking divergence between the western lowland gorilla, on the one hand, and the eastern lowland and mountain gorillas, on the other hand, and raised the possibility that the western and eastern populations, which are separated by about 1000 km (620 mi), constitute separate species (Nowak 1999) . The IUCN now recognizes this separation into two species (IUCN 2000) . A population of gorillas in the vicinity of Mt. Kahuzi in The Democratic Republic of the Congo has sometimes been described as mountain gorillas (Gorilla gorilla berengei (now Gorilla berengei berengei)), but most agree that this population is actually a member of the eastern lowland gorilla subspecies (Gorilla gorilla graueri (now Gorilla berengei graueri)) (Nowak 1999) . Comparison of gorilla population estimates can be difficult, because early on there was lack of a clear distinction between the various subspecies, particularly between the eastern lowland gorilla (Gorilla gorilla graueri (now Gorilla berengei graueri)) and the mountain gorilla (Gorilla gorilla berengei (now Gorilla berengei berengei)), as well as between the different populations of the mountain gorilla. Estimates of the maximum population of the western lowland gorilla (G.g. gorilla) have increased substantially over the years, not because of an actual increase in numbers, but because much of their habitat had been unexplored and they have been discovered to occur in large areas of primary forest not previously known to contain them. Female gorillas weigh 70 - 140 kg (150 - 310 lb); males weigh 135 - 275 kg (300 - 600 lb) (Nowak 1999) . Standing upright, the gorilla reaches a height of 1.25 - 1.75 m (4.1 - 5.75 ft) (WWF/WCMC) . Females become sexually mature at 7 - 8 years, but first mating usually occurs at about 10 years; males become sexually mature at 9 - 10 years, but first mating rarely occurs before 15 - 20 years (Stuart & Stuart 1996) . There is no evidence of a particular breeding season in the wild. 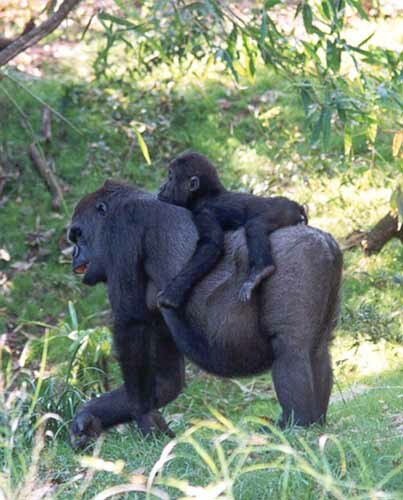 Young gorillas are weaned at an age of 2.5 - 3 years (Stuart & Stuart 1996) . Mean group size: 7.9 (early 1950's); 8.5 (1981) (Virunga population) (Aveling & Harcourt 1984) . Mean group size: 9.2 (1986) (Virunga population) (Aveling & Aveling 1989) .